Congress Goes on Offense to Stop Delphi Pensions from Being "Drained"
During the peak of the Auto Bailout, salaried pensioners from Delphi were, as many believe, unlawfully stripped of their pensions. 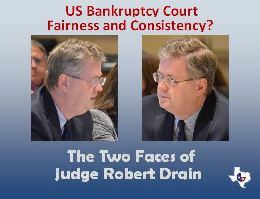 U.S. Bankruptcy Court Judge Robert Drain (Southern District of New York) allowed the Treasurary Department, under the leadership of Secretary Timothy Geithner, to unfairly represent various sides of the case leaving the salaried pensioners virtually unrepresented by counsel. At the time Judge Drain said that because there was a union contract in place for the union pensioners, their pensions could not be touched. In a bankruptcy conference in San Diego last year, Drain told me, "Legally these [union] employees had something that the salaried employees didn't," Drain explained. "They had a collective bargaining agreement." However, as the Hostess union employees found out, not all collective bargaining agreements are created equal. Today, U.S. Representatives Mike Turner (R-OH 10) and Tim Ryan (D-OH 13) announced a bipartisan Congressional Task Force on Delphi Pensions. The task force creates a "Bipartisan Organization to Advocate for Delphi Retirees." Last September, I interviewed Turner about the Delphi Pension Scandal and how it has affected the thousands of members of the Delphi Salaried Retirees Association. At that time Turner said the "entire process was a miscarriage of justice." "The White House intervened in this process," Turner said, "and in doing so, reduced the pensions of the salaried retirees while they fully "upped", or made whole, the pensions of the UAW workers." Democrat Congressman Tim Ryan has long worked with Congressman Turner on this issue. It is a critical issue to many people in Ohio and other states, including Texas. Tens of thousands of the Delphi Salaried Retirees have had their pensions slashed by up to as much as 70 percent in a clear case of discrimination and unequal protection under the laws of our bankruptcy courts. “I remain committed to helping Delphi retirees get the benefits they deserve, and the Delphi Pension Task Force will help advance that goal. The work of the Task Force will be to build a coalition of members that will help us ensure that the Delphi retirees can continue their retirement knowing that they will have the benefits promised to them while they were working. I am grateful to Congressman Turner for his commitment and look forward to working with him and my House colleagues in making this situation right,” said Congressman Ryan. This is very exciting news for the Delphi Salaried Retirees. Now that the partisan wrangling of last November's election is over, perhaps we can truly get back to the work of taking care of these people who worked their entire lives for these pensions only to have them stripped away in a bankruptcy system much in need of repair. US Rep Mike Turner (R-OH) on Delphi Bankruptcy Scandal - "The Entire Process was a Miscarriage of Justice"
Let Freedom Ring's Alex Cortes Discusses Obama Administration's Role in Delphi Salaried Retiree Pension Scandal - "So What if 20,000 People Lost Their Pensions"
A Lawless Presidency - Part 2 - Obama Steals Delphi Pensions - Do You Think Your 401K is Safe? Bankruptcy Courts Part 5 - Is Change in the Air for Bankruptcy Courts?